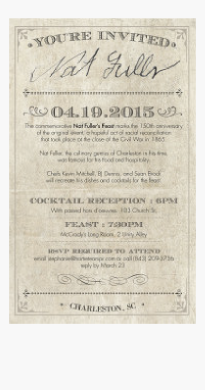 In the 19th century, Nat Fuller was the most celebrated cook and restaurateur in Charleston. His restaurant, the Bachelor’s Retreat, was famed for its pastries and its roasted game and meats. When it came time for a banquet or ball, the city’s most prominent associations and corporations — the Chamber of Commerce, the Charleston Light Dragoons, the St. Cecilia Society — called on Nat Fuller to cater it. The surprising part of the story is that Fuller was an African-American man, and until February 1865 he was a slave. That changed when the mayor of Charleston surrendered the city to Union forces on February 18, 1865, and three days later the African-American troops of the Massachusetts 55th Regiment entered the city. That April, after the war had ended, Fuller invited a slate of prominent citizens, both white and black, to a celebratory banquet at the Bachelor’s Retreat. Chef Kevin Mitchell portraying chef Nat Fuller. Photo by Jonathan Boncek, courtesy of the Nat Fuller committee. Shields, a leading authority on Lowcountry culinary history, spearheaded the recreation of Nat Fuller’s long-forgotten feast and also staged an online exhibition on Fuller’s legacy, which is hosted by the Lowcountry Digital History Initiative. 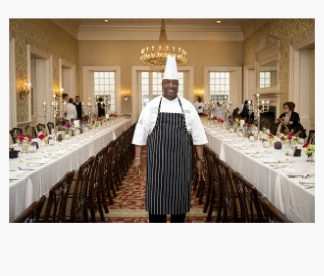 Kevin Mitchell, an instructor at the Culinary Institute of Charleston, took on the role of Nat Fuller for the event as planner, host, and leader of the kitchen. BJ Dennis, himself a noted local chef and caterer, played the role of Tom R. Tully, Fuller’s protégé and successor, who assisted him at the original feast. The Shreveport Reconciliation Dinner will attempt to emulate the spirit of Charleston in much the same way. ¹ From 2015 Charleston Reconciliation Dinner as described in the local paper.